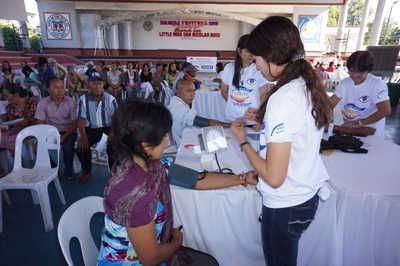 The medical vision mission in Ilocos Norte has been in the making for the last 8 months. We know that in the mission field, we can never make definite plans because they are constantly changing. 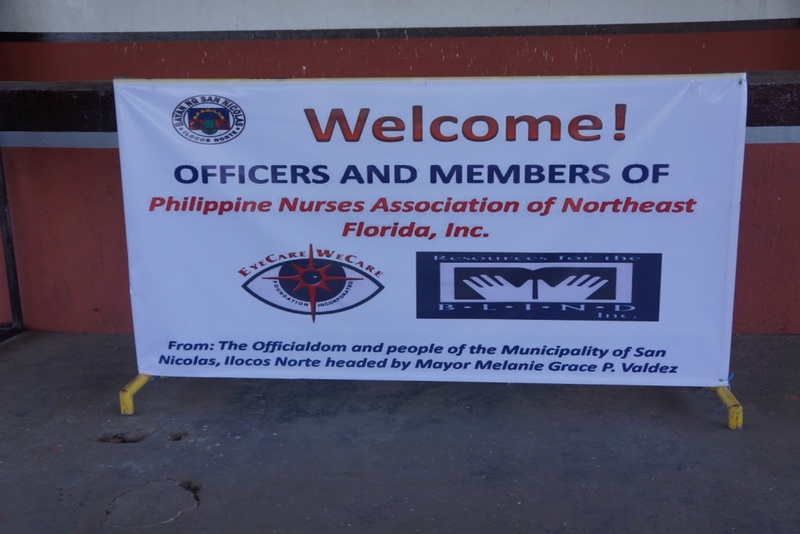 Dr. Weyrich was contacted in May 2013 by the President of the Philippine Nurses Association of Northeast Florida (PNANEF) Vel Callao who also works as a nurse for an ophthalmologist in Jacksonville, Florida, USA. The PNANEF have been supporting our medical missions since the foundation began doing missions using the mobile clinic in 2006. 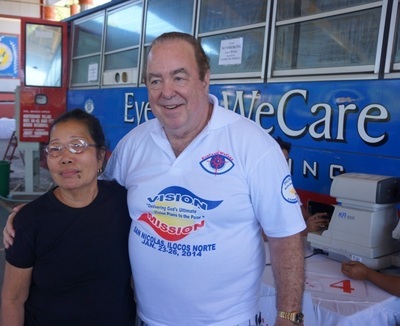 Vel’s husband Ed, has organized fundraising golf tournaments for EyeCare WeCare Foundation (ECWC) for the last 8 years. When she called to request a mission in the most Northern Province in the Philippines, we couldn’t say no. 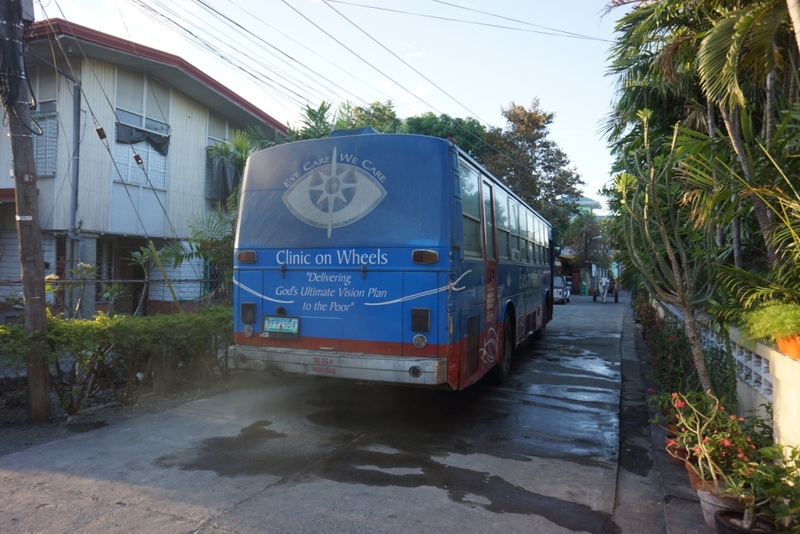 We knew that we would be traveling the very longest that we have for any medical mission, but we accepted and now the mission is history. 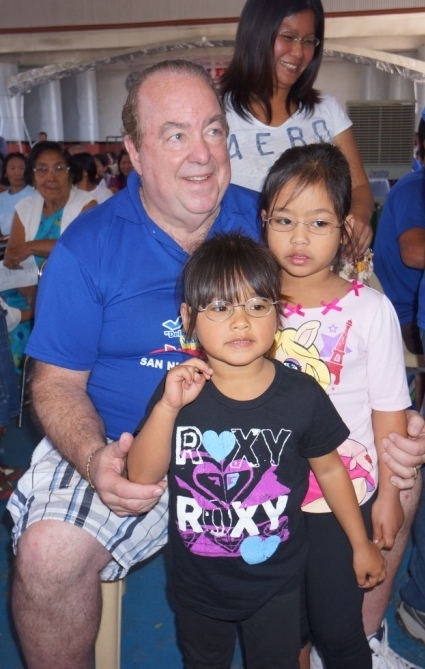 Dr. Weyrich arrived to the Philippines from the USA on January 12, 2014. 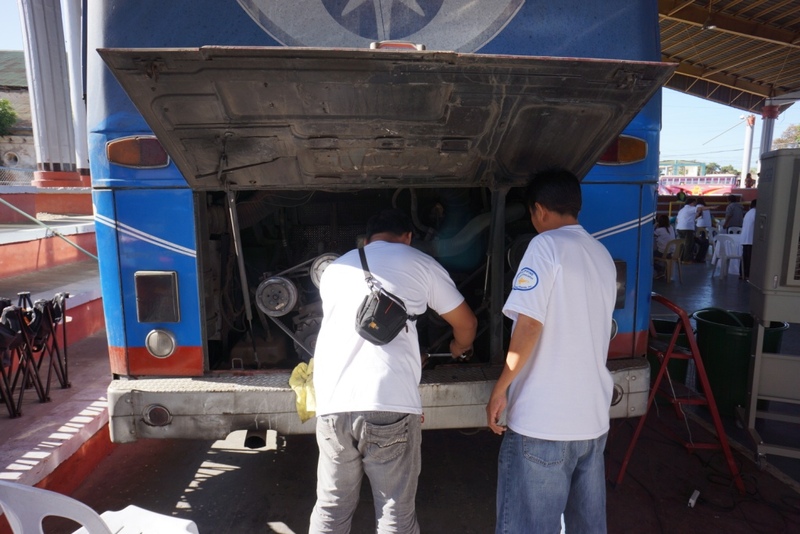 He was planning to go the area to the Philippine that was devastated by Typhoon Yolanda, he saw the mobile clinic with transmission parts inside and outside of the bus. He found out that the rebuilt transmission that was installed last year had failed a test run and only had 2 gears that worked. He made the decision to pull it out and replace it with a new manual 5 speed transmission. 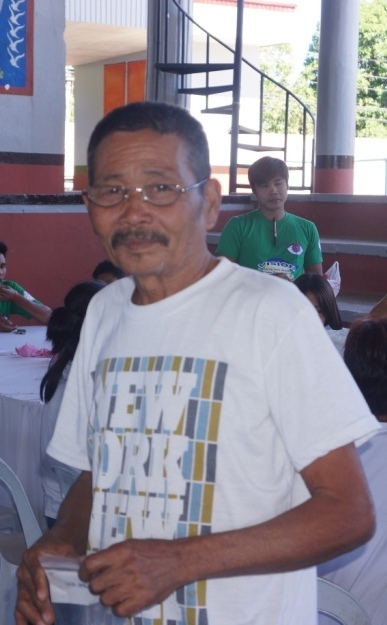 They had to fabricate all the linkages to make it work, so he had to undergo his plan of going to the hard hit typhoon area. 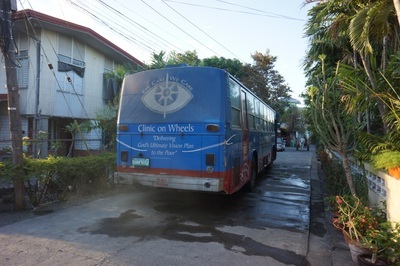 The transmission was finally installed one day before the mobile clinic had to leave for the mission in Ilocos Norte. 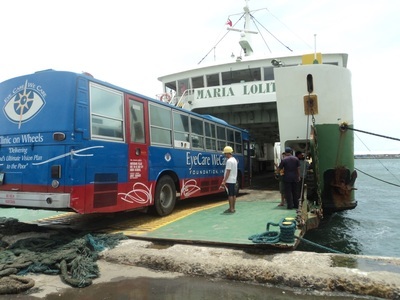 The ferry schedule for transporting the volunteers and the mobile clinic to Manila and on the return did not match our mission dates. 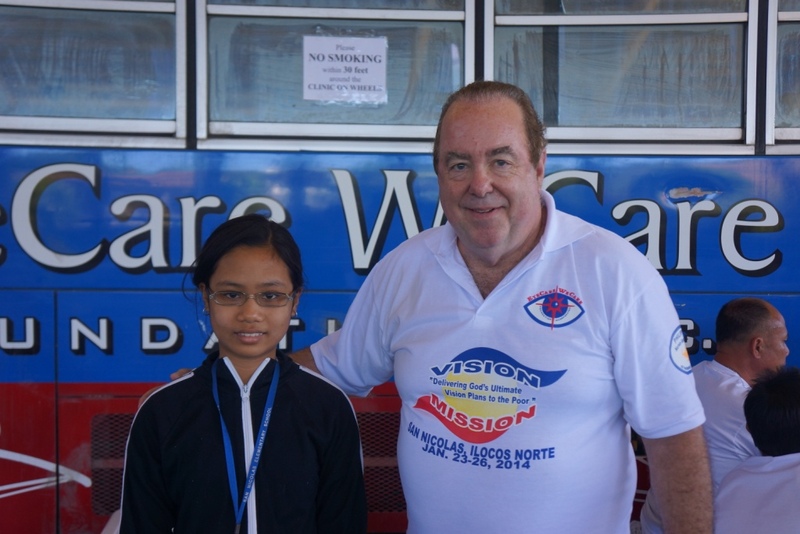 We would have had to leave 2 days earlier and stay 3 days after the mission in Manila to be able to take the big ferryboat that goes from city to Manila. 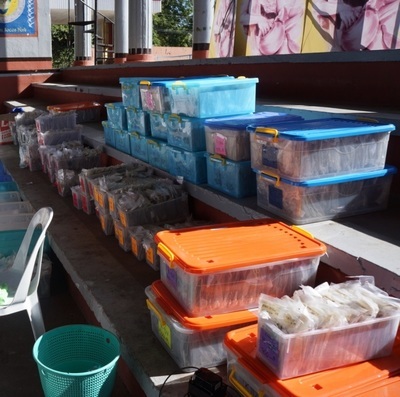 It was then decided to have the mobile clinic leave on 4 days early to go ferryboat island to island and meet the volunteers in Manila when they arrive on the January 22nd. 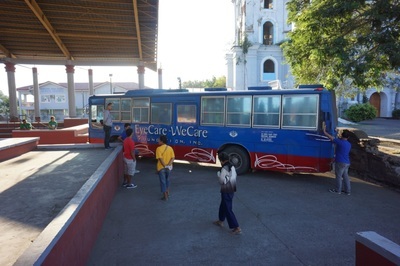 The foundation was able to negotiate with a new Tiger Airlines for tickets of $50 per person round trip). The volunteers that chose to go with the mobile got great drama both on the trip to Manila and the trip back to Negros. On the way to the venue the bus was overheating and had to change a fuel filter. There were strong wind in the seas, so the ferryboats would not sail, so it backed up the vehicular traffic so people had a very long wait and wait up to 8 ferries to cross. The driver and the crew riding with the mobile clinic pleaded with the ferryboat officials to let the mobile clinic go to the front of the line because it was needed for a scheduled for a medical mission in Ilocos Norte. The pleading paid off, but cause there put them at the head of the line and the mobile clinic was able to cross the last two crossing in time to meet the volunteers at the airport in Manila. The trip for the volunteers was a long 12 hour ride in the mobile clinic from the Airport in Manila to Ilocos Norte. But they arrived at 11:30PM. The hosts and sponsors had food waiting and we all stayed at a private residence of one of the sponsors’ sister. The food and accommodations are the very best ever. 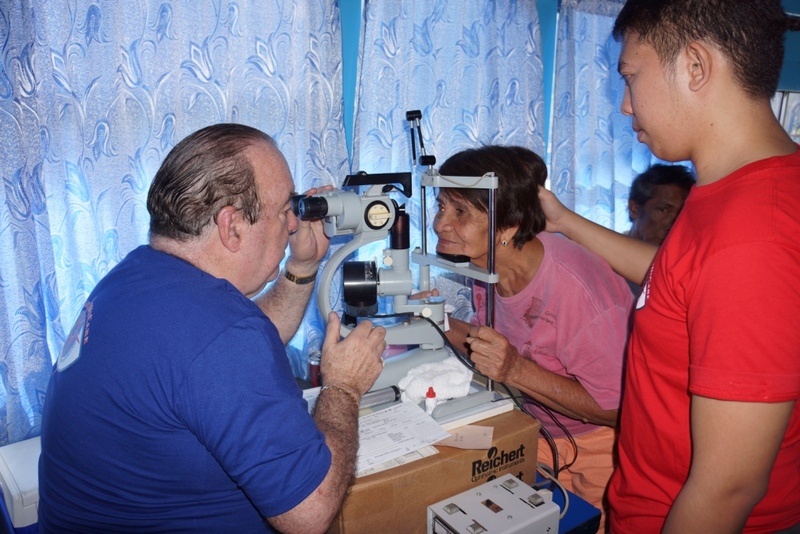 Dr. Weyrich wrote a grant to Bausch and Lomb for 50 cataract surgeries that were to be preformed by a volunteer Filipino ophthalmologists in a local San Nicolas hospital concurrent with the mission. Resources For the Blind (RBI) found a hospital that would allow us free use of their Operating Room for the surgeries during the dates of the mission, a local ophthalmologist volunteered to perform the surgeries. RBI was to provide operating microscopes and surgery instruments. 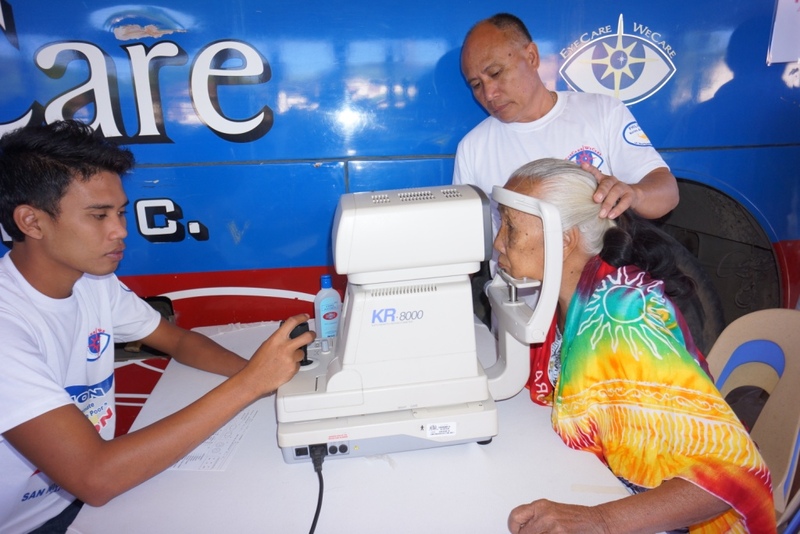 RBI got all the permits and the approval of the Philippine Ophthalmology Society (POS). Then 3 days before the mission the POS went back on their word and denied RBI and the volunteer ophthalmologist to perform the surgeries. They then asked for all of our surgery supplies and they said that they would do the surgeries in August 2014 when they have their yearly charity surgeries. Dr. Weyrich was not authorized to allow the request because of his agreement with Bausch and Lomb. In the past, there have been instances where the premium lenses donated by B&L were exchanged for much less expensive and less quality lenses. After lots of negotiating, it was decided that the cataract surgeries would be completed by the end of February 2014 and RBI would supervise the surgeries. The clinical portion couldn’t have gone more smoothly. We were able to provide eyeglasses for 2,008 indigents and provided prescription eyeglasses to them. 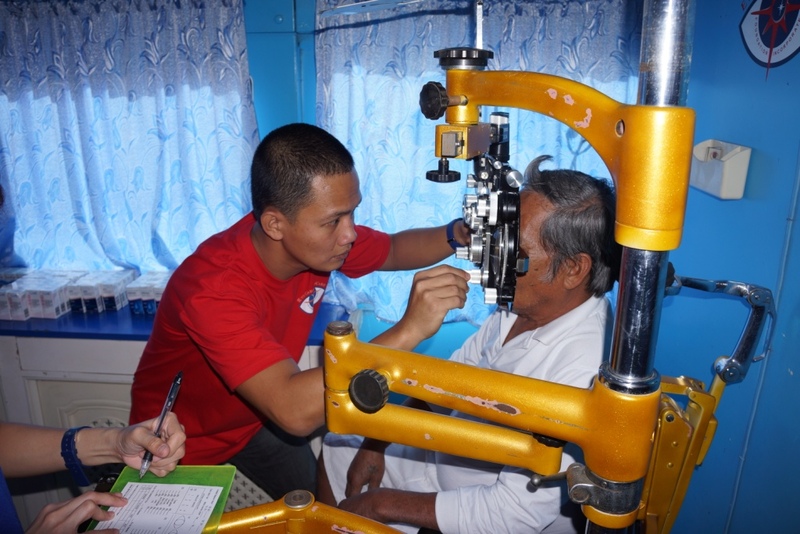 We identified 96 people that needed Cataract surgery. Those people have now been screened and will be having surgery before the end of February – The number of surgeries will be updated when they have been confirmed. A team of 27 EyeCare WeCare Foundation Volunteers, 6 members of the PNANEF and 9 of their extended family members participated in the mission. 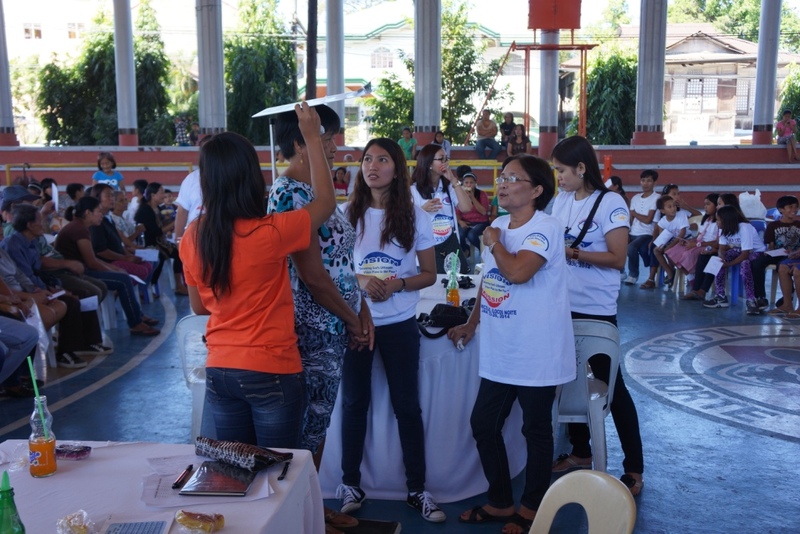 Mayor and Doctor, Melanie P. Valdez, the Municipal Health Officer and his staff of 14 were present for each of the 4 day missions. 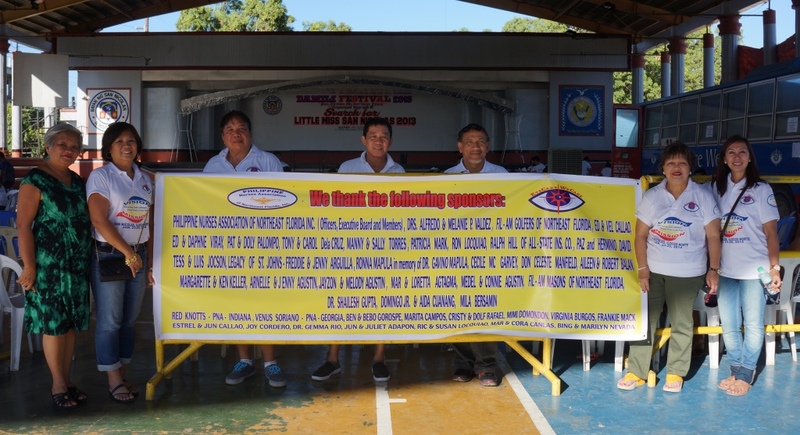 With the combined efforts all working in harmony, the mission ran very smoothly and the people in Ilocos Norte have been one of the most grateful group that we have ever seen. 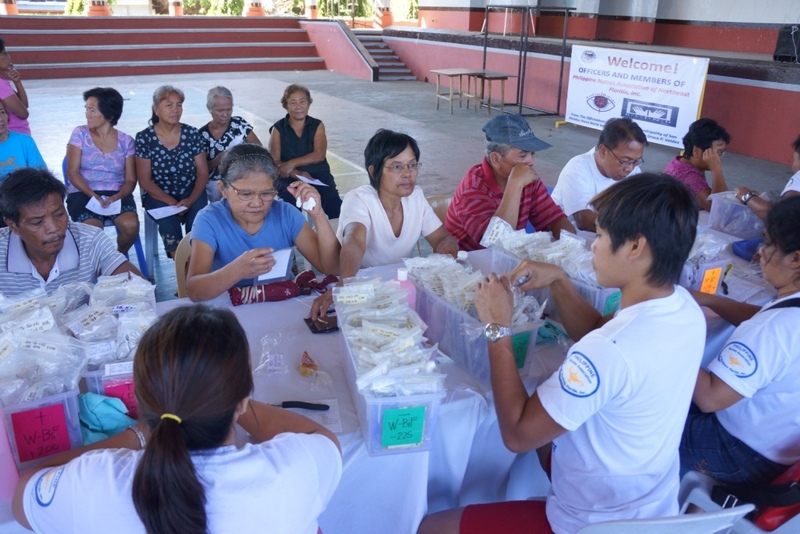 Their screening process really identified the most indigent people. 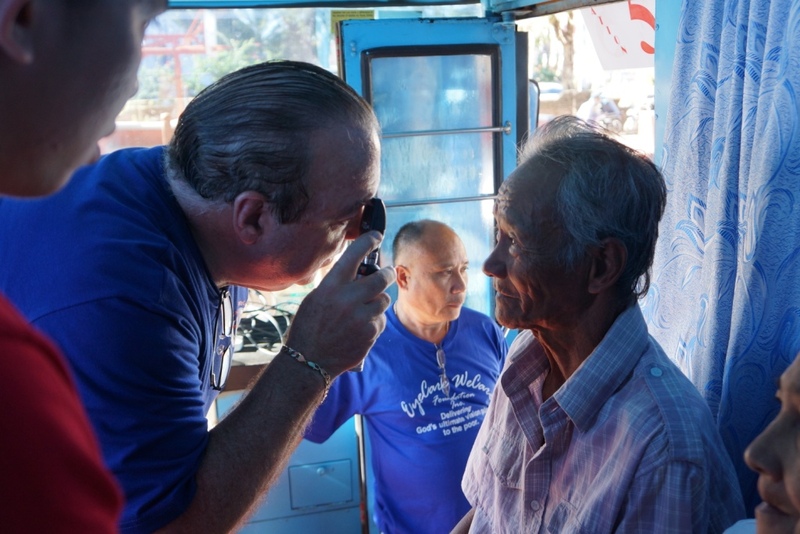 The highlight of each and every mission is the people receiving there eyeglasses. 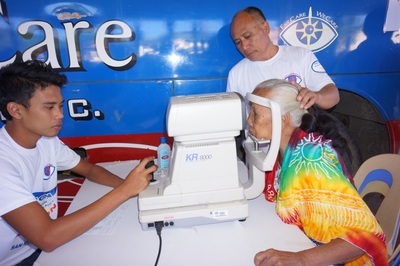 It is instant gratification, because they receive them within 10 minutes from the time that they have their refraction. There were so many tears and hugs from those who received their eyeglasses. 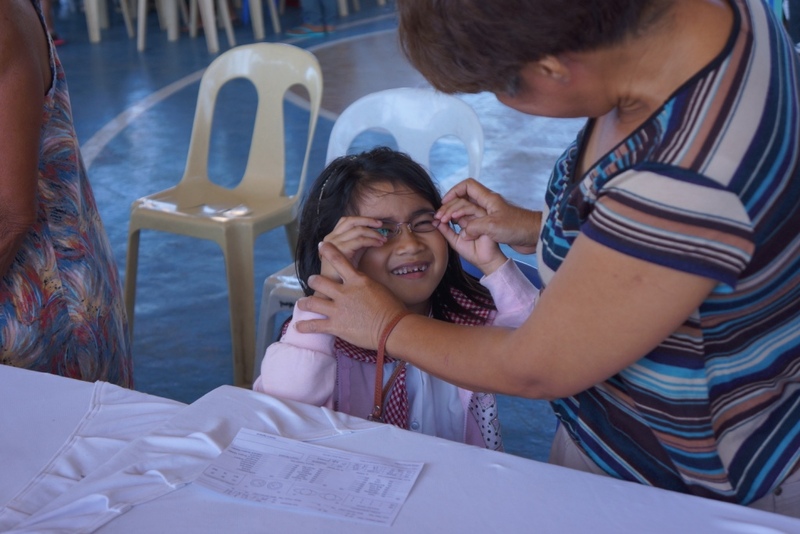 Two little sisters ages 7 and 5 that were both over 7 diopters of power for each eye. 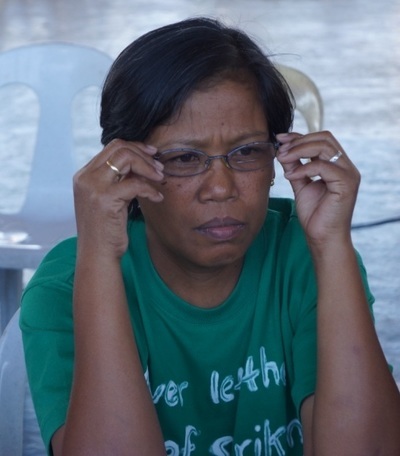 A lady with a +14 diopter farsighted prescription, came it wearing a 12 year old Rx of +9 diopters. They were so scratched that I don’t know how she could even see through them. 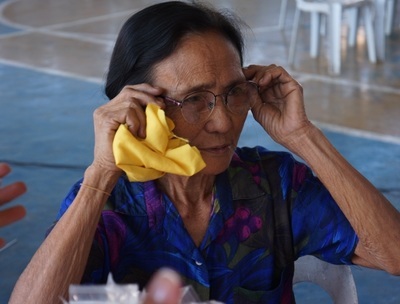 When she got her new glasses, She broke down and cried for joy. It was very difficult not to join her because now she could see again and she said that she can never remember seeing that well. These are the two that stand out the most. The two little girls had never ever worn eyeglasses and could not see the board in school even if they sat next to the teacher. 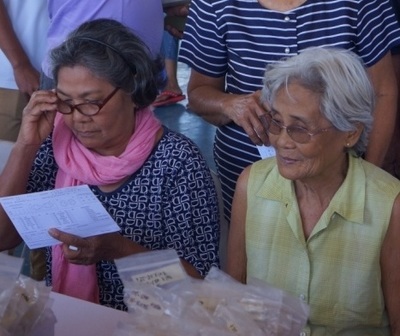 There were many more tear jerking stories of students, housewives, farmers and also very old people that will have their lives change since receiving their eyeglasses. There is one ferry that leaves Batangas and goes to Panay Island and bypasses Mindoro. It eliminated the ferry boat ride to Mindoro, the 9 hours drive across Mindoro and the 6 hour ferryboat ride to Panay island. The ferry directly from Batangas to Panay is a 18 hour ride. 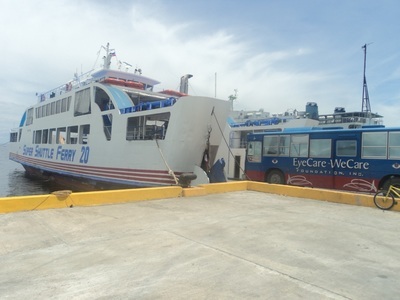 We have a contact in Batangas that is with Customs and by using his name, were able to get aboard this bypass ferry, Right after boarding, it was announced that the boat was in need of repair and they would have to repair it in the daylight. So they spent two nights and two days on the boat, and left late that third night. There was no food on the ferry so our drivers had to walk 3 kilometers to the nearest place to buy food. They finally arrive on Panay Island, drove 8 hours to Dumangas to take the last ferry to Bacolod, their final destination. 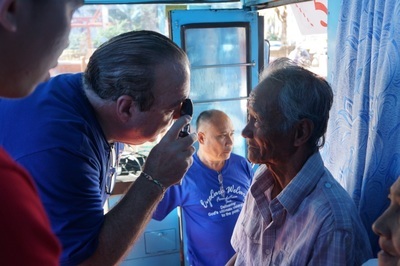 They loaded the Mobile Vision Clinic aboard only to have it announced that there was a number 1 typhoon coming and they will not be able to sail. They unloaded the ferryboat and parked the bus. 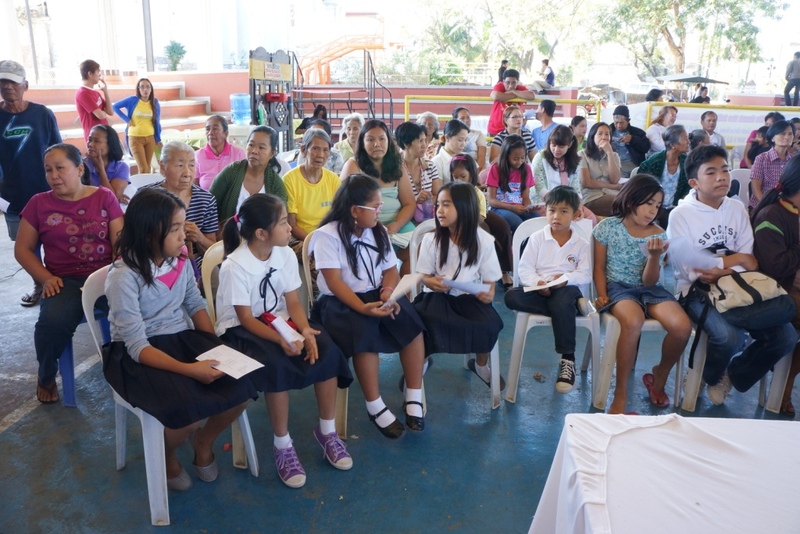 It was 4 days before they could cross the channel, There was no way to get the volunteer's luggage to them until they arrived back on Negros Island. Dr. Weyrich also had his clothes aboard the Mobile Vision Clinic and it arrived two days after he flew to America. Oh well, he will retrieve them when he goes back to the Philippines for the next medical mission.